Happy 2nd Anniversary Tattoo History Daily! In thinking of what might be a good image for Tattoo History Daily’s second anniversary, I scanned my image database to find something celebratory. 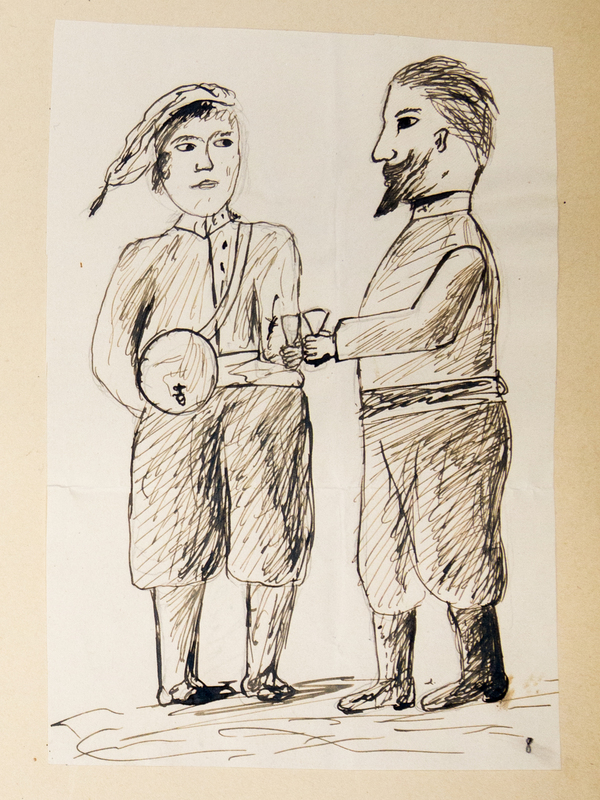 This image of two people clinking glasses jumped out at me, as it seemed that one of them was a female military worker and the manuscript is from the very early part of the 20th century. Reading the caption, I discovered that this image shows a French Zouave (a light infantryman, usually stationed in North Africa) with a cantinière. Googling a bit, I discovered the fascinating history of the cantinières–they were women whose official duty was to accompany troops in combat and sell them food and drink. You can see the tap on her small, portable keg of what I am assuming is wine, although it could also be beer (I am presuming it is something with alcohol content since water was often a health risk in times past). This is one of the many incredible images in a manuscript located essentially in my backyard at the University of Chicago Special Collections (image courtesy them, btw). It’s complied by Louis Vervaeck circa 1907 (clearly from a wide-ranging group of contributors as the hands/styles of the drawings encompass many different artists). Many of these images made it into Vervaeck’s book about tattooing. I’m hoping to do some sort of research project in the future comparing the manuscript to the published book.